Mega Moolah Isis - A Fun and Exciting Game For Everyone! 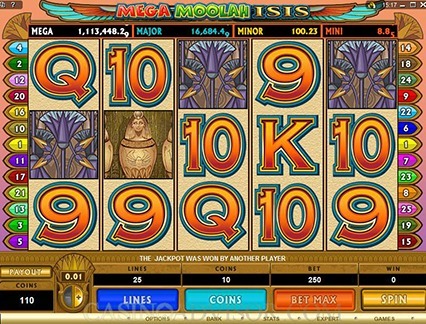 Game Information: Mega Moolah Isis is a popular progressive jackpot game powered by Microgaming. Fans of progressive pokies have deemed this game one of the best there is available, with the Mega Moolah brand being one of the most iconic jackpot games on the Internet. Mega Moolah Isis is an extension of this brand, and instead of the animal theme, the game features a brand new Ancient Egypt theme although the progressive jackpot remains its most popular drawcard. 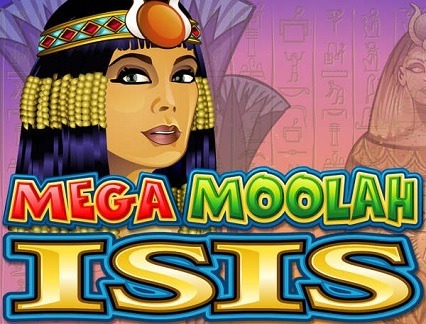 The Mega Moolah Isis pokie is a five reel, 25 payline game featuring an ancient Egyptian theme and a progressive jackpot that could see you become a millionaire in an instant. Isis is the Egyptian god of fertility, so expect plenty of exciting opportunities to reap rewards, including the chance to win 10 000 coins for five wild symbols on an active payline. Symbols to look out for include a golden orb, the Eye of Horus, and a sarcophagus, as well as standard playing card icons that represent lower paying symbols. Before you start playing, you must adjust your bet by clicking on the + and – button. Choose your coin size, which ranges from 0.01 to 0.05, while you can also choose your active paylines by pressing ‘Lines’ and ‘Coins’ chooses the number of coins wagered. Once you are ready, press ‘Spin’ and the game will begin. Land 3 or more scatters on the reels to activate the free spins feature. If you land three hawk symbols you are awarded 20 free spins, four will earn you 25 free spins and five will grant you 30 free spins and a 6x multiplier. The free spins feature can be retriggered. Mega Moolah Isis does not change the game in terms of looks and feel and follows a pretty common Ancient Egyptian theme. That being said, Microgaming is always on top form when it comes to visual and sound effects, therefore players will not be disappointed. Sure, it does err on the side of tradition in its design, but it is the progressive jackpot that is meant to be the star of the show. The progressive jackpot is randomly triggered with Mega Moolah Isis. Players will get the opportunity to play a Wheel of Fortune style game with the hopes of winning. This Wheel of Fortune game will ensure you always win something, with one segment pointing to a massive prize. By spinning the wheel, your prize will be revealed. The four Mega Moolah Isis jackpot are the Mega Jackpot, starting at 1 000 000 credits, the Major Jackpot at 10 000 credits, the Minor at 100 credits and the Mini Progressive at 10 credits. 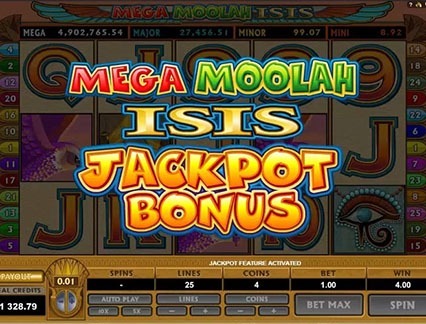 Besides the free spins feature and the progressive jackpot, Mega Moolah Isis also allows players to gamble on their wins for the chance to double or quadruple earnings. Simply take a gamble on the colour of the downwards facing cards to double winnings, or guess the suit to quadruple the wins. Keep in mind that should your bet lose, you will forfeit all winnings.